May 19 marked China's National Tourism Day, a day first inaugurated in 2011 as China has entered a period of mass tourism. This year, Guangzhou lived up to its reputation as the capital of Guangdong province, initiating a variety of activities to promote the city's most popular tourist destinations and its rich cultural heritage. 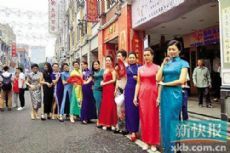 A cheongsam show and other special activities attracted a number of tourists to come experience Guangzhou's famed Lingnan cultural traditions and ancient architecture. The Guangzhou tourism bureau outlined four featured travelling routes to cater to the different interest of tourists visiting the city. An average one day is needed to travel around each of the four routes. Visitors can apply for package tours through the official travel agency websites or related mobile apps. The Guangzhou tourism bureau has also coordinated with local major scenic spots management offices, hotels and travel agencies to provide special tourism discounts to students, military veterans and the elderly. Beginning at the Wuyang Sculpture on Yuexiu Mountain, the route visits the Zhenhai Building, Chenghuang Temple, Ancient Avenue, Nanyue Palace, the Guangdong Museum, Haixinsha Park and Huacheng Square. This route begins from Chenjiaci (Ancestral Temple of the Chen Family), known as the perfect combination of traditional Lingnan architecture and gardens. Afterwards, tourists are invited to the Cantonese Opera Art Museum to enjoy traditional Cantonese Opera before visiting Lingnan Impression Park, a place integrating sightseeing, entertainment, special local foods, shopping and special performances. Guangzhou has witnessed many historical events and changes through its long history. Beginning at China's first modern military school, Whampoa Military Academy, the route takes tourists to visit Dr. Sun Yat-sen's Memorial Hall, the Guangzhou Uprising Memorial Hall and the Memorial Hall for the third National Congress. The Shisanhang Museum, Guangxiao Temple, Huangpu Ancient Port and the Nanhai God Temple are all stops on this route, showcasing China's glorious history in maritime trade during the modern era.